A brand new CD from best selling practitioner, Dr Sarah Edelman who provides us with another tool for becoming more aware and mindful in our everyday lives. Mindfulness Meditation is a technique in which a person becomes more intentionally conscious of their judgement and events in the present instant or situation, non-judgementally. It plays important role in Buddhism with Right Mindfullness meditation being the 7th element of the Noble 8 Fold Path, the Sadhana of which is to engender 'insight' and 'wisdom'. Mindfulness Meditation is an very ancient practice that involves bringing one's attention fully to the present moment. 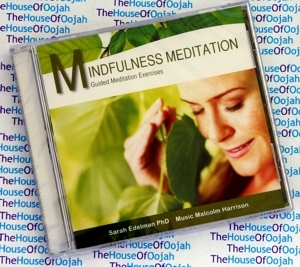 This CD contains guided mindfulness exercises, spoken by psychologist Dr Sarah Edelman Phd. These mindfulness exercises assist the listener to develop the skill of mindfulness meditation. Once these skills have been developed, this skill can also be used to bring mindful awareness to situations that arise in ordinary everyday life. A reassuring voice of Dr Edelman guides the listener to focus on aspects of their current sensory experience, with occasional reminders to focus attention when the mind drifts off. Mindfulness points to: Being aware of and paying attention to the moment in which we currently find ourselves. Our past is gone; our future is not yet here. So what exists between the past and the future is the present moment. If I can observe and not get caught up in my thoughts, it is all that I have. The here and now, the present is the link which holds what was and what will be. My past was a series of present moments which brought me to this present moment. My future will be a series of present moments effected by only present moment in which I am now living, being, doing, observing, being aware or unaware, and attentive or un-attentive. "Mindfulness Meditation" contains 6 guided meditation tracks between 10-12 minutes in length for individuals with recurrent depression. Mindfulness is also beneficial int he management of anxiety disorders and chronic pain, and it assists in the management of cravings for alcohol, nicotine and emotional eating. Position: It is highly recommended that these exercises be undertaken whilst sitting in an upright or sitting position, rather than lying down or prone. The sitting position helps to keep the mind alert, and reduces the likelihood of falling asleep. Intruding thoughts: Humans are continuously and always thinking creatures. When we try to focus our mind we may notice the stream of thoughts that vie for our attention and distract from our object of focus. Mindfulness involves a spirit of non-judgemental awareness. This means acknowledging the presence of thoughts when they arise, but not judging the process or becoming frustrated. Simply notice where your mind has gone and return ;your attention to the object of your focus. This may happen tens of times (or more) during a meditation session. With frequent practice, the intruding thoughts will become less frequent, however they will always be there to some degree. The skill is in learning to recognise thoughts when they arise, and then returning one's attention to the object of focus. - Meditate with your eyes open. Simply lower your gaze or make your gaze diffuse. Sarh Edelman says CBT is not so much about changing personality, but adjusting cognition and belief with evidence. Many of our thinking patterns are established in childhood and can remain stubborn to change, but Sarah Edelman points out that our thoughts and beliefs are influenced for better or worse throughout our adult lives: influences include the social environment, culture, friends and partners. CBT's mantra is that dysfunctional beliefs can cause unnecessary emotional pain, but we can change those beliefs. In the case of anger, CBT entails the person writing down the advantages and disadvantages of staying angry. With panic attacks, Sarah Edelman encourages people to feel the physical sensations, and help them realise the sensations usually quickly pass. For the shy, Sarah Edelman gets people to rate social events from least feared to most, then go about attending such events, all the while challenging their fear that a social gathering will end in catastrophe. CBT can alleviate every-day problems stemming from irrational beliefs, says Dr Melissa Green, a clinical research fellow with the Macquarie Centre for Cognitive Science. These problems include frustration, anxiety, even road rage. Dr Sarah Edelman's book Change Your Thinking (ABC Books, 2006) is a practical and reassuring guide to help overcome stress, negative emotions and self-defeating behaviour using CBT (Cognitive Behaviour Therapy). It demonstrates how to dispute that nagging voice in your head and deal more rationally with feelings of anger, depression, frustration and anxiety.